With the fall equinox just around the corner here in Earth's Northern Hemisphere, it seems like the perfect time to put a space-themed spin on one of America's oldest traditions: the road trip. From September 6-16, The Planetary Society is visiting four NASA centers throughout the southern United States, and you can join the adventure on Facebook, Twitter and Instagram using the hashtag #RocketRoadTrip. So far, our story has taken us from the Columbia space shuttle accident through President George W. Bush's return-to-the-moon Constellation program, which was ultimately cancelled in 2010 by the Obama administration. As we'll see in future Horizon Goal installments, NASA eventually shifted its focus to Mars. The agency plans to land astronauts there in the 2030s, using, in part, a huge rocket called the Space Launch System and a capsule named Orion. With the country on the brink of its first presidential transition in eight years, how is NASA's Journey to Mars coming along? We're going on a #RocketRoadTrip to find out. From September 6-16, The Planetary Society is visiting four NASA centers focused predominantly on the agency’s Journey to Mars program. Even if you aren't a space geek, you've probably heard of Kennedy Space Center in Florida, where rockets are launched, and the Johnson Space Center in Texas, the home of Mission Control. But have you heard of Marshall Space Flight Center, Stennis Space Center and the Michoud Assembly Facility? Without these NASA centers, Neil Armstrong wouldn't have walked on the moon, and there would never have been a space shuttle program. Since the dawn of the space race, the southern U.S. has represented the heart of NASA's human spaceflight program. And that's still the case today, with billions of dollars of economic activity directly attributable to five NASA facilities from Florida to Texas. During our #RocketRoadTrip, we'll be gathering material for future Horizon Goal installments. We'll also be filming new episodes of our video series The Space Advocate to explain these NASA centers' unique roles, and how they impact their local economies. Do you have a burning question about NASA's human spaceflight program? Ask us using the #RocketRoadTrip hashtag, and we'll try to get back to you. See you in two weeks! A note to the folks at Johnson Space Center: We originally wanted to cap the road trip with a visit to Mission Control, where Orion crew training is in full swing, but that would have stretched us into a second weekend away from our families, to whom we are already indebted for their patience. We hope to visit again soon—in the meantime, here's a feature story from our previous trip to Houston. 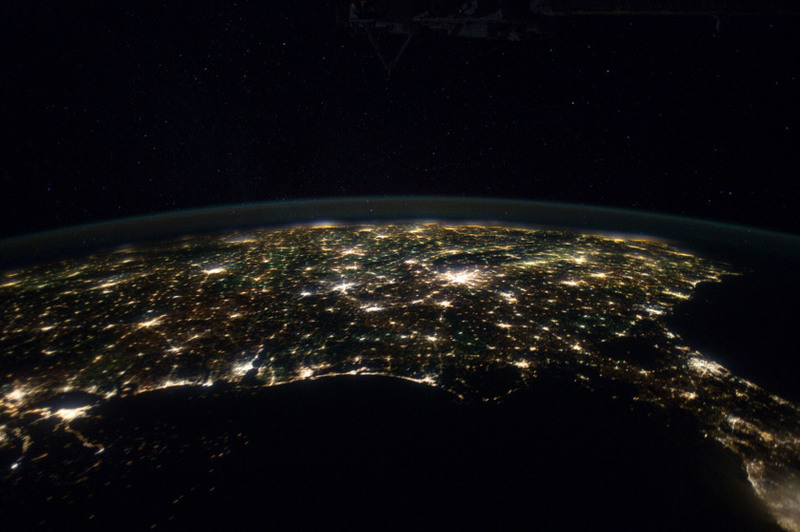 The southern United States and Gulf of Mexico, as seen at night from the International Space Station. The Florida Peninsula is on the right. Our road trip starts with a visit to Kennedy Space Center, where NASA is overhauling decades-old space shuttle facilities in preparation for the Space Launch System and Orion. On Sept. 8, we'll watch the launch of OSIRIS-REx, a NASA science probe heading on a seven-year mission to grab a soil sample from an asteroid and return it to Earth. Marshall has been the hub of NASA rocket design since the Apollo moon missions, when German rocket scientist Wernher von Braun oversaw the development of the mighty Saturn V. The Alabama facility is once again a heavy lift rocket design hub as it oversees the construction of SLS. The trickle-down effect from NASA's Marshall Space Flight Center provides Alabama with 22,000 jobs and an economic impact of $4 billion dollars each year. 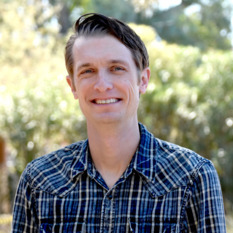 We'll visit a locally based contractor, Teledyne Brown Engineering, to get a firsthand look at the relationship between NASA and its suppliers. Among other NASA projects, Teledyne is building the SLS adapter that connects the rocket's core and upper stages. Deep in southwest Mississippi, a patchwork of concrete and steel test stands rise out of the bayou. Here, at Stennis Space Center, NASA has been testing rocket engines for more than fifty years, and they're continuing to do so for the mighty RS-25, a former shuttle engine that will now power SLS. While we're at Stennis, we'll check in with Aerojet Rocketdyne, a large aerospace industry firm responsible for building a sizable portion of the United States' rocket engine fleet. Aerojet is the prime contractor for the RS-25 SLS main engines. 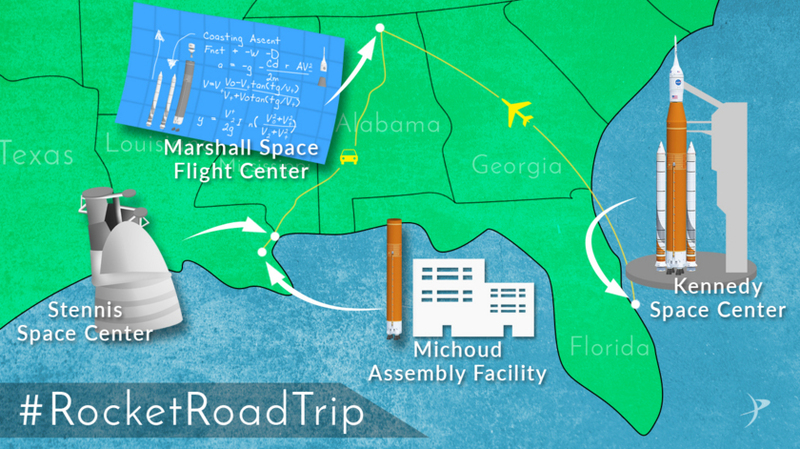 Our trip concludes at Michoud, located on the outskirts of New Orleans, where NASA previously assembled Saturn V rocket stages and the space shuttle external fuel tank. Now, Michoud has almost finished welding together the first gigantic SLS fuel tank. The rocket's core stage will be assembled here and shipped via barge around the Florida peninsula to Kennedy Space Center.